In early October, Cleveland became the first northern port city to sign a memo of understanding with Cuba’s maritime administration—effectively paving the way for future trade possibilities. NPR’s “All Things Considered” called the move an “economic olive branch” amid rising diplomatic tensions between the U.S. and Cuba, and should the current trade embargo be lifted, Cleveland would likely be in pole position to conduct business with the island nation. The agreement makes a fitting cap for what has been a year of rich synergy between Cleveland and Cuba across the spectrum—from art to entrepreneurship to architecture to dance. Much of the exchange took place under the umbrella of Cleveland Foundation’s Creative Fusion: Cuba Edition, an international artist residency program that brought Cuban artists and creatives to work with Verb Ballets, Cleveland Museum of Art, Cleveland Print Room, and the Collective Arts Network (CAN) Journal among others. November marked the culmination of Creative Fusion with a trio of exhibitions: “The Art of Exchange: Contemporary Cuban Art in Cleveland” (November 2-December 15) at Cleveland Institute of Art; “Cuba Now: A Pop-Up Exhibition” (November 10-25) at Cleveland Print Room; and “Through the Lens: Rediscovering Cuba” (November 3-January 2) at the Trudy Wiesenberger Gallery at University Hospitals Cleveland Medical Center. 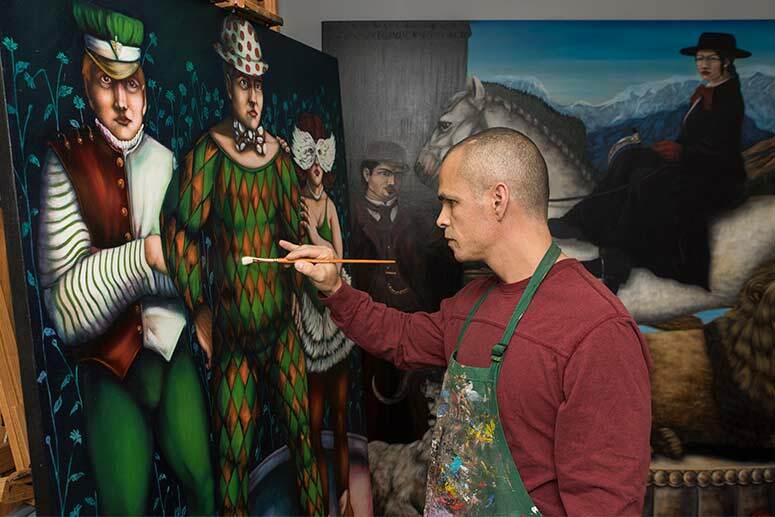 Bordelois is also coming off a successful display at the Stephanie Tubbs Jones Gallery at Cleveland Hopkins Airport. From September 15-October 31, “Kaleidoscope” gave airport visitors a window into Bordelois’ Cuban upbringing and formative moments as an artist. “I have never gotten so much Facebook feedback as I did from those who saw my work in the airport,” says Bordelois, who estimates that his artwork was exposed to as many as 40,000 people traveling through Hopkins. York also has a unique perspective on Cuba, having co-founded To Cuba Now two years ago “shortly after [Barack] Obama made the announcement that we would start normalized relations.” His business partner is Jorge Delgado, a former director of international relations for the Cleveland Foundation with strong family ties in Cuba. Their aim is to provide advising and immersion tours for businesses, cultural institutions, and universities interested in exploring opportunities in Cuba. Over the two-year period, York says that To Cuba Now led at least 20 trips to Cuba for both local and national organizations. 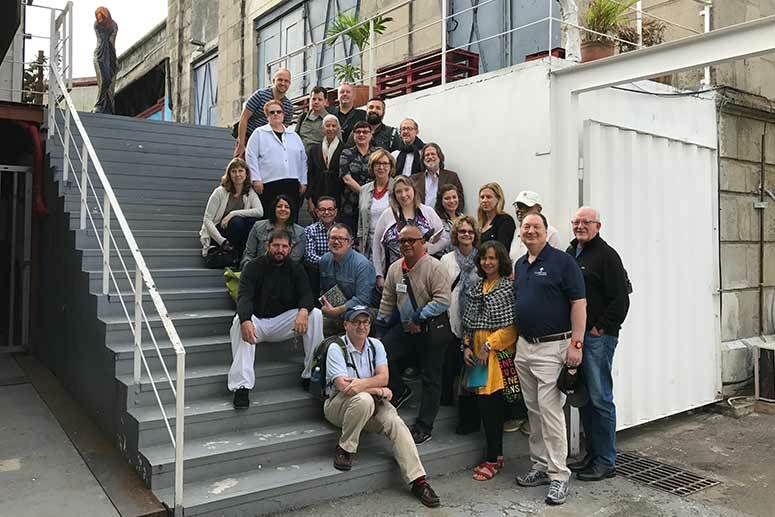 Each itinerary was highly customized—for instance, the Cleveland Foundation’s tour included a presentation on the master plan for Havana and a trip to Malpaso Dance Company, while the Cleveland Leadership Center undertook a social work project and visited the University of Havana for a “Future of Cuba” discussion. York and Delgado were also able to help kickstart potential deal negotiations for companies like Sherwin-Williams and Sunoco, but now he’s unsure of what will transpire under the current administration. Kent State University’s Cleveland Urban Design Collaborative (CUDC) is living proof that such exchange programs can have real, tangible impact. For the last two years, its International Design Exchange (INDEX) graduate studio has focused on urban regeneration strategies for both Cleveland and Havana, drafting design proposals and being mentored by Cuban architects Sofia Márquez Aguiar and Ernesto Jiménez. “We focus on geographic areas by doing background research and site analysis, working on understanding the needs for that community, [and identifying] opportunities for redevelopment or ways to improve the physical environment,” says David Jurca, CUDC's associate director. This year, the INDEX students centered their efforts on Cleveland’s Glenville neighborhood and Havana’s Vedado neighborhood (home to Fábrica De Arte Cubano (FAC), or “Cuban Art Factory”). Jurca and his team chose Glenville primarily due to its involvement in the FRONT Triennial as home to the PNC Glenville Arts Campus. “On a much smaller scale, that site seemed like an interesting complement to the FAC as a cultural arts and design hub located within a neighborhood that could spur equitable reinvestment in the surrounding area,” shares Jurca. Jurca has made two trips to Cuba this year—once in January as part of the Cleveland Foundation cohort, and again on spring break with his graduate students. 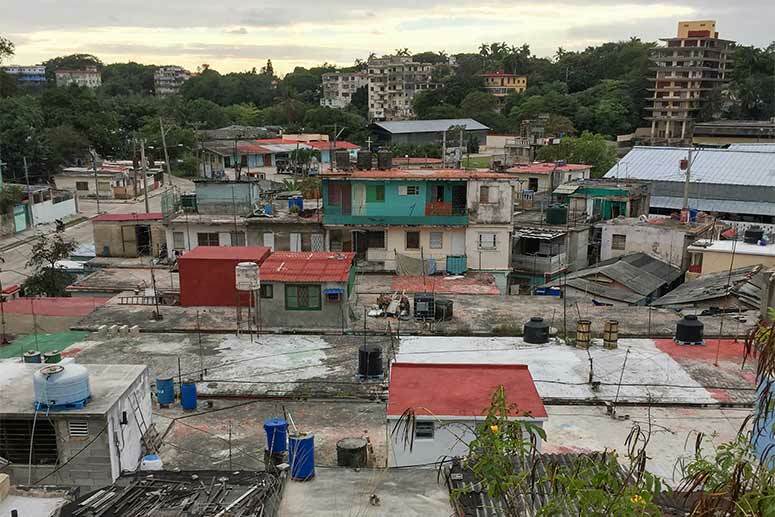 Not only were the students able to view their chosen site (the El Fanguito slums on the outskirts of Vedado), but they also participated in a two-day workshop in which they received feedback and critique on their design proposal from local architecture and design students. When the group returned in April, they worked to “identify some of the ideas generated for Havana that have transferability to Cleveland,” according to Jurca. One major takeaway was the resourcefulness exhibited by the people of Cuba—specifically those living in El Fanguito who make “improvised housing” from scrap metal and wood. Using that inspiration as a jumping-off point, the group organized a workshop on KSU’s main campus to build furniture for Glenville’s public spaces using salvaged wood palettes. They also solicited suggestions at a Gathering Glenville event in July, at which neighborhood residents requested more outdoor seating, benches, and picnic platforms. From there, they generated a prototype for a picnic platform to be built along E. 105th Street on the Glenville Arts Campus. Jurca hopes the picnic platform will act as “breadcrumbs” to facilitate that exploration. The team recently sent out files to have CNC cutting done for modular benches (aka “super seats”) that can combine together in different configurations. The project is set to wrap in December, which will also mark the release of the INDEX Studio Report. “Based on the ideas we generated, the report will be provided to our partners on the ground, and we can use it to continue conversations with officials and local residents,” says Jurca. The fruits of CUDC’s labor can also be viewed at the current “The Art of Exchange: Contempory Cuban Art in Cleveland” exhibition at CIA’s Reinberger Gallery. 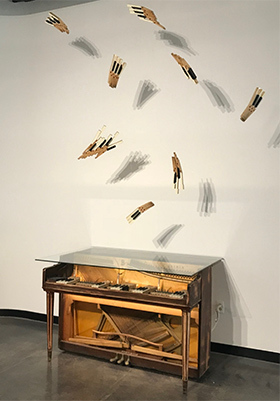 One of the pieces on display is an old piano that visiting Cuban artist Aguiar repurposed into a bar and tabletop for a CUDC event held at the former Winnie’s Nursery in May. “It was one of the first pieces we secured, and a symbol of a project Sofia did while in residence [with CUDC],” says Nichole Woods, Reinberger Gallery acting director. Piano FuerteThe piano is just one of numerous works that represent the collaborations that took place in Cleveland between local and visiting artists. Cases in point: jewelry created by Cuban designer and CIA artist-in-residence Yasniel Valdes with CIA professor Matthew Hollern over a period of three months, and a trio of photolithographic prints created by Cuban printmaker Sandra Ramos alongside CIA master printer Karen Beckwith. The exhibition features works from 13 artists in total, many of which display the resourcefulness that inspired Jurca and his students. Woods believes that, on a larger scale, such resourcefulness is what unites Cleveland and Cuba, and what drives the potential for their respective resurgences.